The EnGenius EDS8022 Wireless Surveillance System features long-range point-to-point surveillance at high speeds, providing excellent clarity no matter the time of day in even the worst weather conditions.Equipped with a built-in motion and audio, security is made easy and clear with the ability to record H.264/MPEG-4 and motion JPEG video clips at 30 frames per second. The Engenius EDS8022 has many exciting features for users of all types. You can extend the lifetime of your Engenius EDS8022 with the purchase of a FactoryOutletStore Factory Protection Plan. 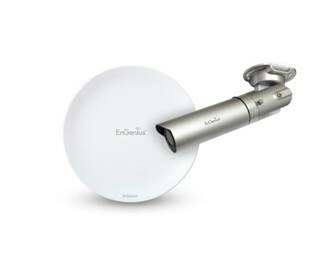 See the Engenius EDS8022 gallery images above for more product views. The Engenius EDS8022 is sold as a Brand New Unopened Item.